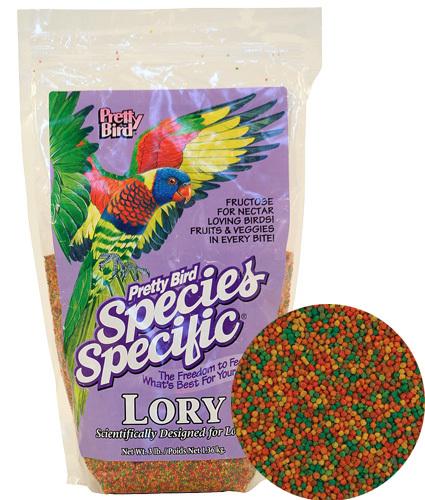 An easy to feed alternative to messy nectar diets and contains fructose. Lories also love fruit which should be offered on a daily basis. 16% protein and 6% fat in mini sized morsels. INGREDIENTS: Corn, Wheat, Oat Groats, Soy Concentrate, Corn Gluten Meal, Fructose, Soya Oil, Coconut Oil, Raisins, Coconut, Papaya, Apricot, Banana, Sweet Potato, Pineapple, Apple, Spinach, Broccoli, Carrots, Dates, Calcium Carbonate, Dicalcium Phosphate, L-Lysine, Choline Chloride, Natural and Artificial Flavors, DL Methionine, Isoleucine, L-Threonine, L-Tryptophan, Vitamin E Supplement, Ascorbic Acid (Vitamin C), Ferrous Sulfate, D-Biotin, Yucca Schidigera Extract, Zinc Oxide, Manganous Oxide, Niacinamide, Magnesium Oxide,Vitamin B12 Supplement, Mixed Tocopherols, Copper Sulfate, Calcium Iodate, Citric Acid, Calcium Pantothenate, Vitamin A Supplement, Sodium Selenite, Folic Acid, Riboflavin, Pyridoxine Hydrochloride, Thiamine Mononitrate, Natural and Artificial Colors, Menadione Dimethylpyrimidinol Bisulfite (source of Vitamin K3), Vitamin D3 Supplement, Cobalt Sulfate, Rosemary Extract. Guaranteed Analysis: Crude Protein (min) 16%, Crude Fat/Oil (min) 6 %, Crude Fiber (max) 3 %, Moisture (max) 10 %, Ash (max) 4 %, Vitamin A (min) 12,000 IU/kg, Vitamin D3 (min) 800 IU/kg, Vitamin E (min) 200 IU/kg, Copper (min) 10 mg/kg.